Pam Pulling Smith sent the AJS this picture and some wording (below) to accompany it. 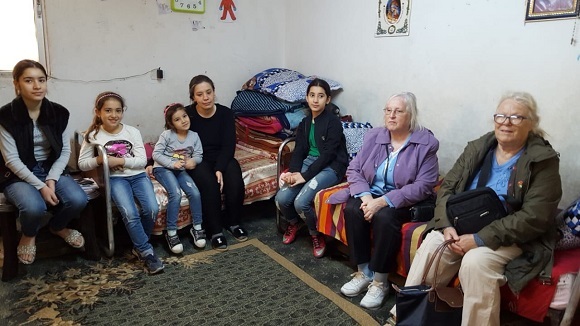 Pam and her sister’s trip to Jordan is not through any monies raised from the AJS, it is something that Pam organises herself and she agreed to share her story with us, thank you Pam. A very big thank you to all of you who have supported me with donations and goods ,in my efforts to help Christian refugees from Syria and Iraq. A special thank you to the Friends of Belmont for their generous donation and to Belmont school for the very generous gift of clothes. My sister and I managed to get out 6 suitcases full,(over 150 kilos) of children’s clothes, also new undies, knitting needles, pencils and toothbrushes, all of which was gratefully received by Sister Nejla for distribution to the most needy families. We also handed over £1500 for shoes,needed so children can go to a school, medicines and other hygiene products. Again this will be used for the most needy. Whilst there we visited some families, mainly Iraqi, from Mosul. One family is in the photographs above; they live just in this one room, 3 beds and a cupboard for the 4 girls and their mother. The kitchen is in a cupboard, less than 1 sq mt and I refrain from comment about the toilet! The husband was killed and the mother has now sold all her jewellery including her wedding ring,. The clothes we delivered were gratefully received. Please just ignore the 2 on the right! The weather was unusual during our stay with Petra being evacuated for the second time in less than a month due to very heavy rain leading to flash floods and several deathbed. Unheard of for this time of year is that 2 of the dams are already full to capacity. The lightweight rain jackets we provided will therefore be necessary. I wish I could say that our help will no longer be needed but that will not be the case. Whilst many families have applied for permission and visas to move abroad, this is now being denied as people are being told that as Iraq now has a government, people can return home. But to what! Their homes have gone, blown up, burnt, and they do not have the money to rebuild nor the wish to even try. Please do contact me if you would like more information about our trip and/or the plight of the Christian families. Thank you so much, I cannot do this without your help.